Currently, the popularity of hosted e-Commerce platforms almost matches the open source ones. Mostly, they are celebrated among startups and newbie e-sellers for one main reason - their utter simplicity. It’s as easy to sell on a hosted solution as it is on a marketplace. But with a shopping cart you’ll have way more opportunities. According to various stats, our own ones and general web stats, the top three carts of the category are - Volusion, Bigcommerce and Shopify. That’s why now we’re posting Shopify vs Bigcommerce vs Shopify comparison. We hope it’ll help you make decision. Enjoy! As far as popularity goes - Shopify is far in the lead. It doesn't necessarily indicate functionality greatness - may be a good work of Shopify’s marketing. However, there’s no smoke without fire - there are many attractive traits about the cart that make many people love it. Ease of use, is the main one. Shopify is famously simple - it’s set up within minutes and doesn’t require any technical knowledge to customize looks and add products. I think it’s admin panel is a golden standard of how a clear and convenient dashboard should look. No unnecessary features to bloat the view and confuse the user. Functionality is also on the decent level. In particular, our customers named such reasons of moving to Shopify - “Unlimited bandwidth and customization options”, ”Lots of apps and marketing tools, great SEO and design options”, “Best design templates out there in a big selection”, “Ability to easily integrate with other systems”. These are real quotes - reasons that made Cart2Cart clients switch to Shopify. Consider them. Pricing plans:. Basic Shopify ($9), Shopify ($29) and Advanced Shopify ($299). There is a 14-day free trial period offered by all plans. Plans differ in provided functionality, but all offer unlimited number of products and file storage, what is gold. Additionally, there’s an opportunity to sell offline and online simultaneously. But you’ll have to contact Shopify’s team to establish the price of that. Another option is Shopify +, an enterprise cart edition plan, that seems to be positioning itself as a separate SaaS platform - it doesn't have standard price as well. Design is Shopify’s strongest side in this comparison. Doesn’t matter how many reviews you browse, you’ll find only ecstatic praises of Shopify themes. They’re 100% responsive. They look stylish, professional and, in Shopify’s general fashion, are easy to modify. You can choose a free theme of 21 provided, or a paid one, to make your store look even more unique. Beware of a little catch - paid themes are easier to customize than free ones. That’s Shopify’s way to incline you towards spending money, I guess. But we can’t blame them for that, it’s just business. If you, miraculously, can’t find an appropriate theme among Shopify’s ones - upload your own, that’s allowed. As for the Bigcommerce vs Shopify comparison - carts used to be back-to-back competitors, until Bigcommerce raised its prices. Now, the cart appears to be aiming at the richer, enterprise clients than at e-Commerce beginners. In terms of ease of use, the platform is great - polished and intuitive. When you login to admin panel, it shows you what there’s to do to get your store running: Add Products, Set Up Shipping etc. Similarly to Shopify, it provides modules for customization, accepting credit cards etc. This is helpful and interesting, especially to someone inexperienced. Customization options are comprehensive, the procedure of adding products is clean and API access can be obtained easily. It doesn’t matter what technical level you’re on, Bigcommerce usability will impress you. Functionality o of Bigcommerce is a bit more difficult to master than Shopify’s functions. But it is just as (or even more in some instances) advanced. The cart provides lots of great tools out of the box, whereas Shopify requires installation of additional modules to expand the basic, starting functionality. Platform’s marketing and SEO tools are worth attention. Title tags, descriptions and keywords to each product, custom URLs, ability to modify robot.txt, make your own 301 redirects and much much more - are all at your disposal. When it comes to promotion Bigcommerce stands out big time. Regarding other features - they are as robust as the ones on Shopify, just a little harder to manage. Price. There are couple of Bigcommerce pricing plans - Standard - $29.95, Plus - 79.95, Pro - 199.95 and Enterprise - the price is revealed upon request. Unlimited bandwidth in each plan, good set of features even in the cheapest one, and increasingly powerful functionality with each upgrade - the usual and effective system. You should note that the Pro plan only allows 3,000 orders per year. And if you get more than that, the platform will charge extra $80 per each thousand of new orders. This peculiarity pisses many people off, and a lot of them then become our clients and move their businesses to Shopify. Design.Bigcommerce offers around 100 high-level design themes. They surpass the ones on Volusion in terms of quality, but, in my opinion, are less sophisticated than Shopify’s templates. Your can upload your own themes, but the procedure is trickier than on Shopify. Finally, we get to a cart that’s, according to Google Trends, is the least popular in our comparison. However, let’s not forget - it’s among the top carts in the world, and guys like Intel are their clients. Ease of use. Volusion, though not similar to Shopify and Bigcommerce in its administration ways, is still easy to navigate. It has a steeper learning curve, but it won’t take you long to get a grip on it. Volusion has published a series of videos to get people acquainted with how their stores are managed. They’re trying, that’s admirable. Functionality. Though SEO functionality is built in, it isn’t as easy to manage as on Shopify, and it is less advanced than on Bigcommerce. Other thing worth mentioning is how the cart deals with cart abandonment. It shows you a list of visitors that left without buying, with products left in their carts. It includes such functionality even in the $35 plan, when on Bigcommerce you need to be on $79 plan at least, to have such advantage. However, Volusion’s feature is weaker here han the one on Bigcommerce. It only shows people who left, without providing an option to automatically email them etc. - you’ll have to take care of that yourself, manually, or using paid plugins. It is worth to say Volusion features are great to beginners, just less advanced than the ones on two previous carts. Price. Volusion provides four plans - Mini ($15), Plus ($35), Pro ($75), Premium ($135). The Mini plan only allows you to add 100 products (1 Gb bandwidth), the Plus plan - 1000 products (3 Gb bandwidth), Pro - 10 000 products (10 Gb bandwidth), and finally Premium - Unlimited Products (35 Gb bandwith). Considering that on Shopify and Bigcommerce you can add as many products as you wish right from the cheapest plan - Volusion’s pricing doesn’t look tempting. Design. Though there is a decent selection of themes on Volusion they are not all responsive and so modern and stylish that the ones on Shopify or Bigcommerce. Also, templates are harder to edit. If you’re not a developer who’s comfortable with HTML and CSS, it’s going to take time and effort to really make the store look your own. It’s hard to really compare Volusion vs Bigcommerce or Shopify vs Volusion or Shopify vs Bigcommerce because, in the end, it all comes down to your needs and location. Shopify is great, easy, and cheaper than Bigcommerce, but isn’t really oriented at European market, Bigcommerce is more international. Volusion is another high-level platform, but it requires some HTML and CSS knowledge from you. Weigh all the uplisted factors and conduct your own research before choosing the e-Commerce solution. If you’ve made up your mind already - Cart2Cart will gladly help you to migrate to or from any of these platforms. Perform a Free Demo migration with Cart2Cart service right now! 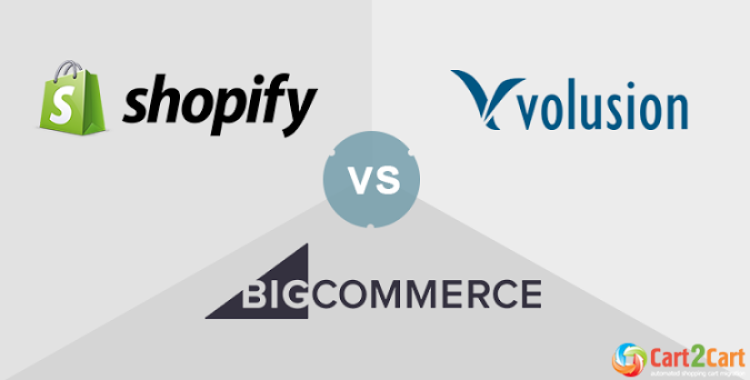 2 thoughts on "Volusion vs Shopify vs Bigcommerce - The Best Hosted Shopping Carts Compared"
You didn’t mention magento as an option. Does that tell me that magento is old news and not near these guys as an option? Thanks a lot for your question. Undoubtedly, Magento is one of the most popular, flexible and robust platforms as well. For more info regarding this sales panel click here!